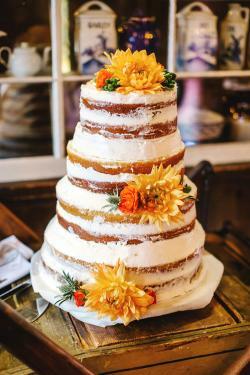 Although roses and lilies are some of the most traditional floral options for reception desserts, a sunflower wedding cake can't be beat for its pure brightness, charm, and beauty. It's an obvious choice during the warm summer months and into fall's harvest, but there's no reason to rule it out even at other times of the year. Before rushing out to the nearest bakery, give the aesthetics of your cake some thought. The most important part will be the sunflowers, and you have several options to consider with how they'll appear on the cake. You can have fresh flowers, edible frosting flowers, or inedible flowers; each will lend a slightly different look to the finished dessert. 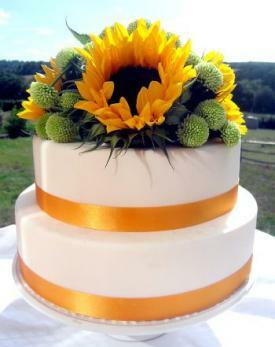 Use sunflower wedding cake design photos to help you select the right design scheme, from simple to rustic to more elaborate. Fresh flowers are likely to have the most stunning effect on a cake. Their brightness is almost unparalleled in the flower world, and their size makes any cake that uses them an automatic attention-grabber. However, be aware that if you want to use fresh sunflowers on your cake, you'll have to pay for them, especially if your wedding is during the off season and the flowers have to be shipped from somewhere far away. The more flowers you have, the pricier the total will be. There are also logistical concerns with using fresh flowers on your cake. The flowers need to be in a relatively cool environment to survive and stay vibrant, so you won't be able to set them up on the cake too far in advance unless you have a method of refrigeration to use until right before the reception. Also, fresh flowers won't last for longer than a day or two in advance of the wedding, even in storage, so if your sunflowers arrive at the last minute and there's a problem with them, you'll need to have a backup plan in place. 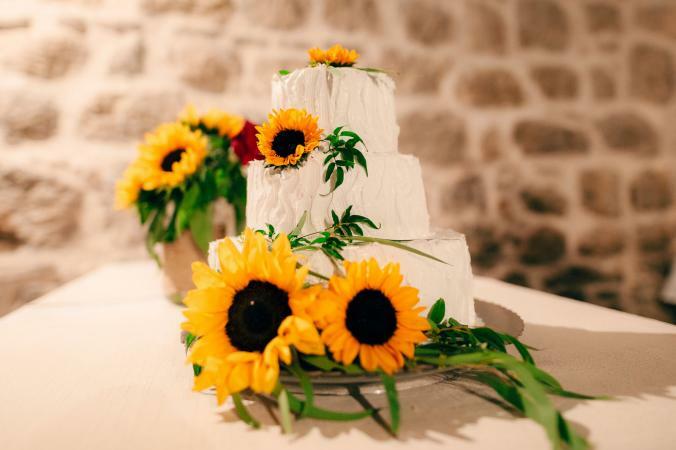 Some brides and grooms don't like the look of sunflowers made with fondant or gum paste because they are obviously not "real," but from the hands of an experienced decorator, they can add beautiful and elegant touches to a cake. Although they will cost more than a simpler dessert because of the intensive work involved in producing them, the total may still be less than what it would cost to ship in fresh sunflowers from afar. 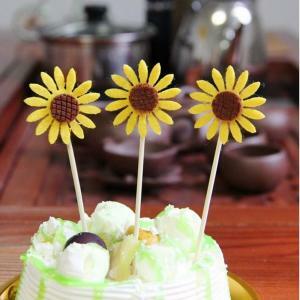 Fondant sunflowers also offer the advantage of flexibility. Decorators can make them in any size and shade of yellow or golden and place them anywhere on the cake. The sunflowers are also fun for guests to eat, even though they may not taste quite as good as the buttercream alternative. Due to the gooey nature of buttercream icing, sunflowers made with it won't look quite as photorealistic as those made with fondant might, but they'll almost certainly taste better. Buttercream's rich, sweet flavor and creamy texture win out over fondant's chalky qualities and saccharine taste, and cakes with buttercream flowers can look bright and shiny at any reception. When the sunflowers are made with buttercream that uses shortening, they can also hold up to relatively high temperatures, so they won't melt or break down when on display at a summer wedding. 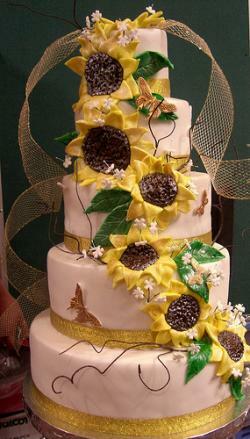 Fake sunflowers aren't the most popular choice for a wedding cake, but they are one of the most affordable. Faux sunflower bouquets are available at thrift stores, craft stores and decorating stores, and they rarely cost more than a few dollars. If the craftsmanship is high-quality, it'll be difficult for guests to tell the difference between the flowers on the cake and real, fresh sunflowers. The fake florals are also a wise choice when time is of the essence and you need a sunflower wedding cake put together on short notice. These flowers cake be added to a burlap ribbon and make a great option for a country wedding cake. While the type of sunflowers you use on your cake will factor into your design, it's also important to consider the various decorations you can create using the sunflowers. A small rustic cake is the perfect option when you only want a small, two tiered or single tiered cake. 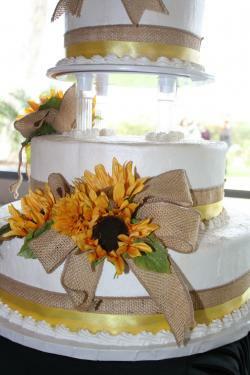 Place the rustic design on a pedestal and then surround it with matching sunflower cupcakes. Making the cake base resemble a wood log is perfect for a country wedding. Just because your cake lacks some frosting (the naked cake trend is going strong) doesn't mean it has to lack decorations. 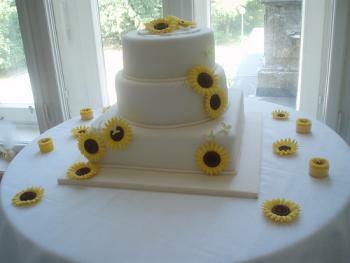 Add some sunflower blooms to the top and several tiers for a little something extra. If you don't want to cover your cake in sunflower blooms, you can just add a topper to the cake. Finish with a great decoration that adds summer or fall flair to your country wedding scheme. Place sunflower topper sticks in the final tier of your cake, then add a little piping detail to finish it off. 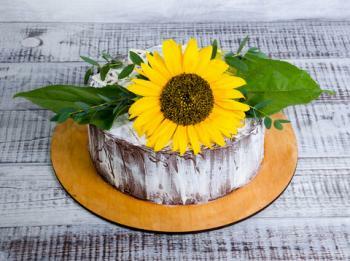 One of the best parts of having a sunflower cake is that it will look fantastic with almost any design and shape. 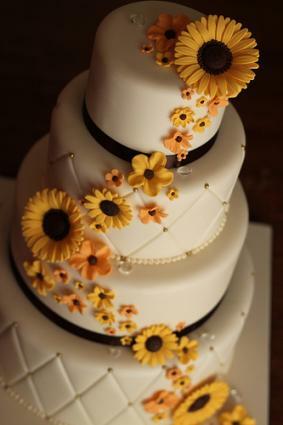 Tiered square cakes, round cakes, or sheet cakes will also work well with the flowers, and even a tiny wedding cake could look dramatic and imposing with a big fresh sunflower on top. A cascading design also looks particularly good with the bright yellow flowers. For more ideas, browse pictures of wedding cakes, sketch out design ideas of your own, or talk with a decorator about possibilities that will fit your price range.